Yesterday, I was working in my old herb garden in my hometown, in southern Virginia. There’s something deeply relieving about revisiting a place that you’ve cultivated in some way. Tending it and exchanging whatever energy through time you’ve tied yourself to each other through. There’s something to that, you know? Places are like that with me. Plants are like that with me, and gardens especially. All the kinds of gardens that can exist. Whether it was the Osha (Ligusticum porteri) seed I sprinkled in the soil cracks in the Wallowas, the Thyme (Thymus vulgaris) I planted at Dancing Springs in Barnardsville, the Calamus (Acorus calamus) at Juliet’s or in my parents’ creek sneakily buried in mud and grasses, the Monarda and Elecampane (Inula helenium) I buried long ago in the soils of my dad’s little spot in the world. It reminds me that I feel most whole while gardening, while taking care of plants, while watching them, and feeling a utter since of joy and heart-openness to plants that I only occasionally feel with humans. Or rather- plants allow me to step into the heart open realm a little more with humans. My friend Kym and I processed Ginger (Zingiber officinale) with my dad from his greenhouse crop, tended all summer, making sure to keep the greenhouse doors open for the breeze to flow through. We dug Elecampane root, from plants I have put in the ground years ago but never harvested. I think they will enjoy a little ruffling, a little space to spread out- as I divided some of the roots and replanted the small ones elsewhere. In the old herb garden digging Elecampane. Photo by Kym Slade. Whenever I hang out in that herb garden, I find myself often drawn to long staring into the wild hedgerow that follows a metal fence, all of it at the top of the property, on a little knoll. This knoll means I can hear things way in the distance, unfortunately the interstate sometimes, other times it is the donkey next door, hunting dogs or coyotes way out there. The hedgerow consists almost solely of Eastern Red Cedar or Juniperus virginiana. This is not an abnormal hedgerow to have in these parts of the world, especially on these high and dry sites. My papa has them at his farm, in the field, along the fence line, along the pond. 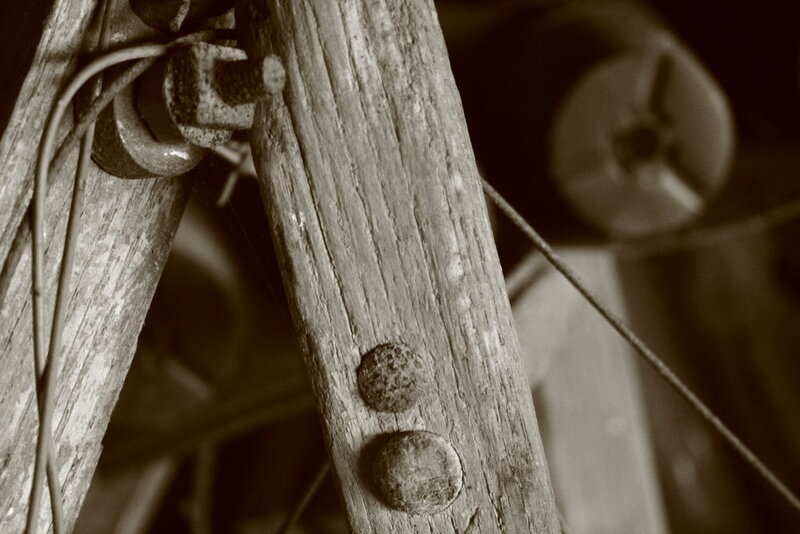 Pretty much everything at his farm— the old fence posts that still stand 75 years later, some of the farm equipment that back in the day they handmade and even black-smithed the iron parts- are made of this Cedar, or sometimes Oak. The fence line might have Cedar posts, with live Cedar trees growing next to the posts wrapped in barbed wire and painted white. Sometimes they are rough hewn, other times they are made nicely. handmade farm equipment- at my papa’s brother’s farm - made of cedar or oak. By the Juniper hedgerow. Photo by Kym Slade. October 2018. Post, at my papa’s farm. The tree turned ‘object’ for separating here from there. For keeping cows out, or coyotes in, or children from getting stampeded by the bull. Painted white to mirror the sun, to reflect heat outwards. The summer is an oven. 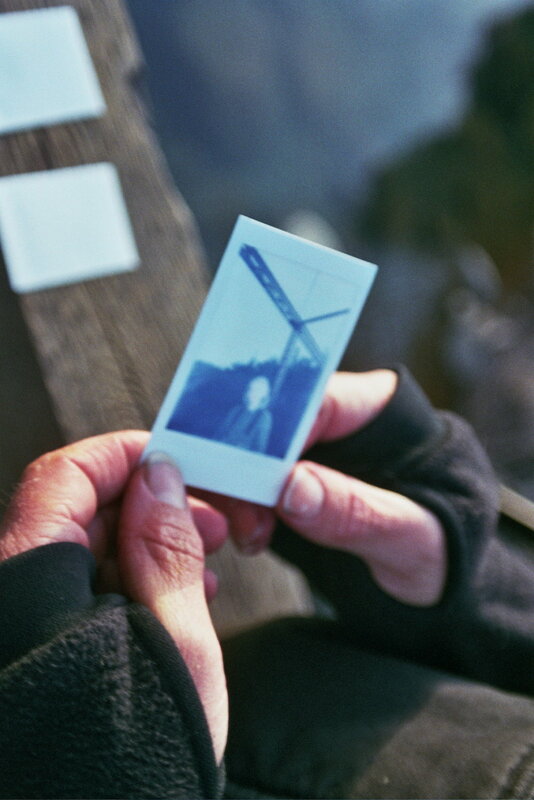 Photo from Oil and Rust artist book. 2. So, the Eastern Red Cedar I mention from my dad and papa’s farm, as well as other Juniperus species, are all in the Cypress plant family, or called the Cupressaceae. When I chat with my horticulturist dad about his ornamentals in this family, he refers to them as ‘Cupresses.’ Alongside Junipers, a few other members of this family that some folks might recognize include the grandiose Redwoods (Sequoia sempervirens) which mainly grow in coastal California, Incense Cedars which mainly grow in the Sierras of California with some range in northern California and southern Oregon (Calocedrus decurrens), Western Red Cedar which is primarily found in the Pacific Northwest and northern California along the coast (Thuja plicata), Cypress (Taxodium distichum), and Sequoia (Sequoiadendron giganteum) which is mainly located in the southern California Sierras range. Cypress family plants are Conifers, a broad general grouping characterized by their cone-bearing seed dispersing techniques. Not all Conifers are in the Cypress family though (like the Pine family for example, Pinaceae). Plants in the Cypress family, including Juniper species are considered gymnosperms, which is the name for the ‘naked seed’ dispersal techniques of older more ancient plant families that include all Conifers as well as trees like Gingko. Most plants in this family are evergreen, but a few are not. Their seed cones vary in style and structure. Some plants in this family have needle-like leaves, others scale-like, and some start off needle-like and move to scale-like in age. Plants in this family can be found pretty much all over the world, from some of the coldest or highest locations, to some of the lowest and warmest. They can be found in moist or dry locations, and often they are specialized to that ecology and location and can be rare where found. You’ve got Junipers up on high mountain peaks in Nevada, and Swamp Cypresses in Florida down in the lowlands- both genus’ are in this plant family. My dad talks about selling all kinds of different ‘Cypress’ varieties at our family nursery that ran from the 60’s until two years ago in the Piedmont region of southern Virginia, this included a mixed of hybrid species, cultivated species and straight up wild species of different trees and shrubs in this family. After talking to him this week about it, he named some things he sold and used in landscape plantings including ‘Leland’ Cypress Cupressus × leylandii (a Monterey and Nootka Cypress cross, popularly used among horticulturists to plant fast shade. It’s mainly infertile, with a few exceptions), ‘Swamp/Bald’ Cypress Taxodium distichum (my Great Uncle planted one on a tiny island in a pond at his farm, this species is found in the wild mainly in the southeastern U.S. lowlands), and ‘Italian’ Cypress Cupressus sempervirens (native to the Mediterranean). He sold Cedrus species like ‘Blue Atlas’ Cedar Cedrus atlantica, (native to northern Africa) and ’Deodora’ Cedar, Cedrus deodara (native to the Himalayas) which are NOT actually in the Cypress family but the Pine family. These are the species the ‘Cedar’ common name is likely based on. He used Thuja species and cultivars like Arborvitae, ‘Green Giant,’ and ‘Green Emerald.’ The Juniperus species he used were ‘Blue Pacific,’ ‘Blue Rug,’ ‘Nick’s Compacta,’ ‘Blue Lake pfitzer’ and a lot of other different ones he couldn’t remember. He also planted trees that were in the Chamaecyparis genus in the Cypress family. Though my dad and I have completely different interests in plants (though that is changing on his end)— he in cultivars and ‘pretty’ things, I in ecology, medicine, ethnobotany and history of plants— we can talk about this stuff and be on the same page, or at least hold conversation. I can prompt him with some good questions and he knows what I am talking about. In California, there are endemic species of Cypress that grow on serpentine soils like Cupressus sargentii and Cupressus macnabiana. Of course there are tons more Cypress’ out there and so much more to say about the Cypress plant family. I am tempted to go deep into different Cypress family topics more like discussing the Chamaecyparis species of the West and East coasts (Atlantic White and Port Orford), Redwood and Sequoia tree taxonomy, Thuja talks and more. But! For the sake of moving on, let’s get to talking about Juniper. Juniperus virginiana (Cupressaceae) from South Hill, VA.
and sorting out the ‘cedar’ thing. 3. 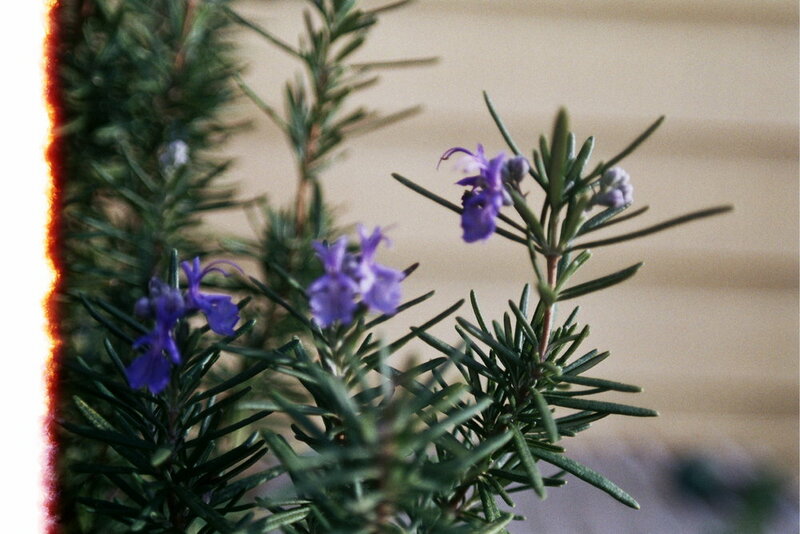 Junipers are in the Juniperus genus. Many plants called Cedar are also actually in the Juniperus genus, including Eastern Red Cedar, which we’ll cover below. Yet, the Western Red Cedar of the Pacific Northwest is actually a Thuja, not a Juniper, and not as ‘closely’ related as we would assume based on the common name usage of the word ‘Cedar.’ The common name Cedar actually came from the name for the ‘true Cedars’ of Lebanon that are trees with the genus Cedrus, actually in the Pine family, not Cypress, like I mentioned above. Although, this word was also used to describe other trees like Juniper even in the Middle East and Europe before the European colonization of Turtle Island. This word came to Turtle Island, and was used to describe things that looked like the Cedars in the Mediterranean that botanists and naturalists recognized. The Cedrus Cedars are even mentioned in the Bible, and even mentioned many times as a plant that held ritual cleansing uses. Even in the Bible, scholars think that they are referring to ‘Cedar’ that is actually sometimes a Juniperus and sometimes a Cedrus based on studying the actually ecology of the places described. So, this loose use of the word Cedar has been floating around for quite some time. Nonetheless, it is used to describe trees with a special magical quality which are often revered and honored. Utah Juniper or Sierra Juniper (more likely) in the High Sierras, California. Winter 2015? Utah Juniper and California Juniper are closely related and sometimes hard to tell apart. The scaled-leaves tend to be rounded in shape (vs. flattened like Thujas). Juniper berries are not technically berries but rather coated seeds, but berry-like in appearance. They are edible and medicinal, and would fall more into the medicine category with more moderate use as food. Lots of folks traditionally have eaten the berries. As some folks have told me (like Luke Learningdeer)- you know when to stop eating the berries cause you just feel it is enough. The berries are dark blue at maturation, and are often light blue to white before this time and with the look of a yeasty glaucous sheen on the surface. 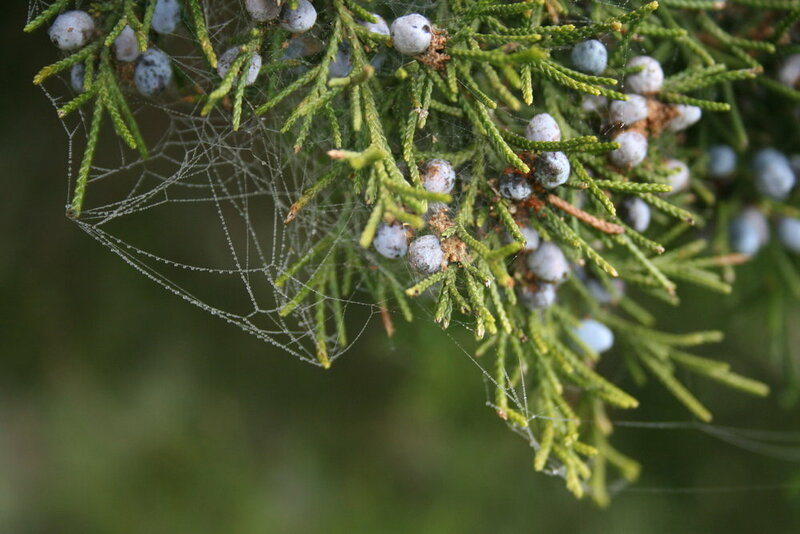 The ripening time of Juniper berries varies, from half a year to a year or more between rounds. 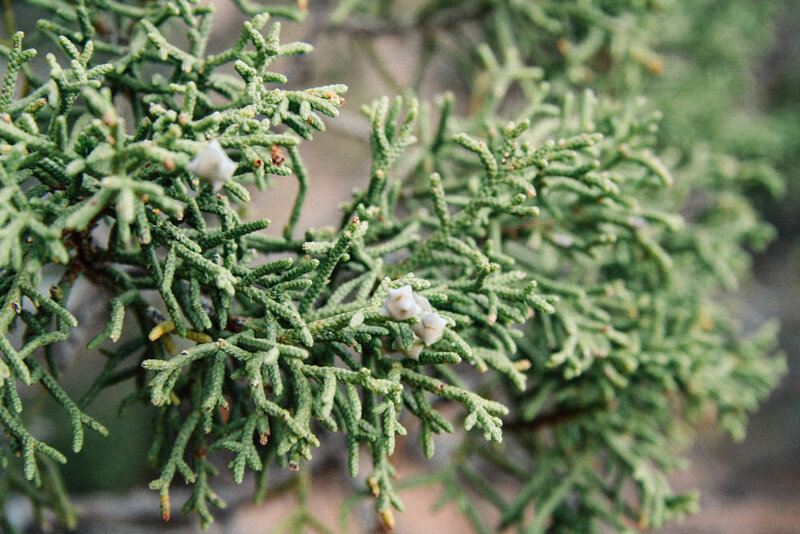 Some species of Juniper release pollen in the fall, others in the winter and spring. Some species do this more than one time a year, depending on the conditions. The pollen can cause allergic reactions in some, as is the case for other plants in the Cypress plant family, as well. I tend to get sneezy when the Incense Cedars (Calocedrus decurrens) go off in the Sierra foothills. This past May when traveling in Utah, I mistakenly thought I was reacting to Cottonwood ‘seed fluff’ which isn’t pollen, but was actually probably allergically reacting to Junipers or Piñon Pine pollen. Although, I’ve talked to other desert dwellers who swear it is the Cottonwood seed fluff that irritates their sinuses. Read my plant profile on the ‘Cottonwoods’ here. 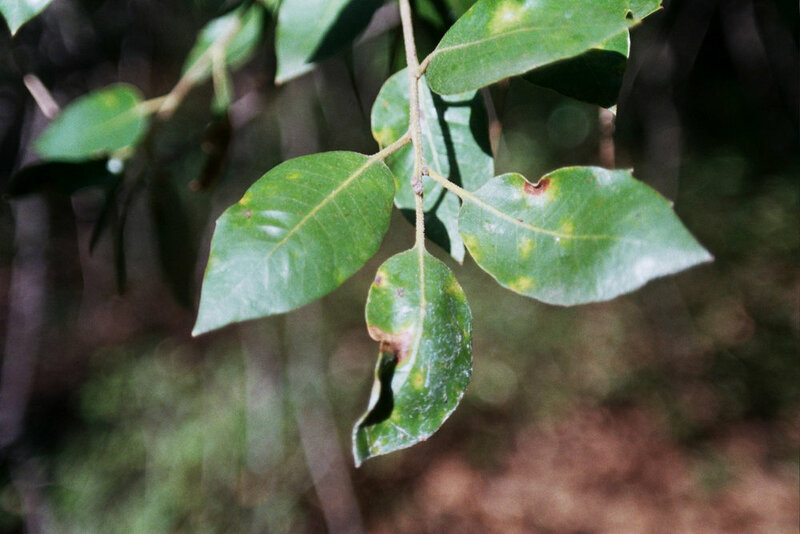 The bark is brown and peeling, and can often turn shades of gray as the plant gets older. It’s important to note here that some species are easily mixed up with Junipers like Arizona Cypress Cupressus arizonica for example in the Southwest and Mexico. It’s also important to remember the toxic plant Yew, Taxus spp. could potentially get confused with Juniper especially when it is in it’s needled form. I’ll admit, I have confused them before, or rather not paid enough attention to their different forms and red ‘berries’ once in northern Idaho. Apparently, the species Juniperus sabina is more toxic than other species of Juniper and should not be consumed. I keep seeing this written, though I don’t know the science, and it might be worth looking into more. I’ll do an overview of a few Juniper species, with the main focus on the species that I experienced the most growing up, Eastern Red Cedar. Most Junipers will thrive in lots of different climates, from poor soil and low sun to rich soil and wet, though the high and dry hillsides are probably their preferred. Fire suppression has increased the populations of Juniper species in all of the ranges they grow. The way this looks in a specific location is different depending on the ecology that Juniper belongs to in that region. Many species of Juniper have craft and medicine traditions in Europe, Africa, the Middle East and parts of Asia and as well as in parts of Turtle Island where it is found. Juniper has been associated with some of the earliest humans settlements found worldwide. This is something to think about when considering the ecological and cultural significance of this plant in deep time. I cover generally at the bottom of this piece a little more detail on these uses. 4. Juniperus virginiana, or otherwise known by its common name Eastern Red Cedar is the familiar species of my upbringing. It is a fairly common tree of the Southeast (less so in the mountains), Midwest and Great Plains regions of the the U.S. where it can grow on a wide variety of soils. It is more abundant than 200 years ago. This is partially because of fire suppression as this tree is highly susceptible to fire. It thrives when fire does not come through, dominating the ecology of an area and sometimes overtaking other species, or preventing others from growing, which is one reason why culturally it is deemed a ‘weed tree’ in the South when it is actually a native species. This association with the tree being ‘weedy’ is also because it grows up as a pioneer species in disturbed agricultural fields that have been left a bit to abandon, seeming to ‘overtake’ attempts to cultivate and control fields for crops or livestock. High rates of disturbed soil in its range and fire suppression have increased the amount of places it thrives, and gives it an upper hand over more sensitive plants that would otherwise come up instead. It can grow a long time, an unusual thing for a pioneer species. I have seen it in full deciduous and mixed deciduous/Pine/Holly forests as well as in open fields. In the forest, it seems to have less lower branches and a different kind of growth pattern. Some say these are a different subspecies, but I am not certain. The trees that come up in fields have such low and dense branches that you can barely even see the tree’s trunk sometimes. Older trees can have pretty big and thick trunks. Some of these trees have growth rings that are darn close together, making them strong and durable for making fence posts (not to mention their rot-resistance) and ‘Cedar’ chests. It has been loved and hated. Like many other Juniper species, this plant was(is) used by the native inhabitants of the regions where it grows for food, shelter, and medicine. In the Southeast U.S., where I am most familiar, it was not a tree that most folks wanted around especially during the days of early European colonization due to it’s ability to infect precious fruit trees in the Rose family with the ‘Cedar Apple Rust’ fungus. This pathogen is hosted on Junipers, and spreads easily to Apple trees, some Hawthorns and other plants. It can spread to Apple fruit, flowers and leaves, and inhibit the ability for the tree to thrive or for the fruit to mature properly. My dad made the mistake of planting old heirloom varieties of Apple trees on his homestead in southern Virginia more adapted for the mountain weather and not the Piedmont- and where Eastern Red Cedar is less likely to grow. There are resistant strains of Apple out there and treatments that can stop the reproductive cycle of the Cedar-Apple Rust which unfortunately usually includes the use of fungicide applications. The old way was to remove as many Eastern Red Cedars as possible. To the point even that the tree was vilified, coincidently too at a time when native folks who saw the tree as sacred and useful were being displaced. This tree was seen as a threat to the survival of colonizers, as the Apple orchard was seen as the crux of survival off the land, at least historically for the making of hard cider to drink daily. After reading the Apple overview in the book ‘The Botany of Desire’ by Michael Pollan, I have a better understanding of this early settler homesteading'-survival mentality and what it meant at one point in time. Juniperus virginiana bark. South Hill, VA. October 2018. Still, much to the chagrin of the early European colonizers, Eastern Red Cedar persisted. The tree is not having any problems reproducing or thriving. It isn’t as common in the Appalachian mountains where the conditions aren’t as ideal for it. I do remember that we had a few at Dancing Springs Farm where I lived for several years outside of Asheville, NC. They were only located on top of a knoll on the land with the driest and poorest soil, as the best soil has drifted down towards the river bottom, where we gardened. It has the potential to replace grasslands when fire isn’t allowed to come through, as it will eventually outcompete important native grasses. To step back again in lens to the plant family, I wanted to make a few notes on some of Eastern Red Cedar’s Cypress family neighbors and kin. Atlantic White Cedar, Chamaecyparis thyoides can be found from Maine to North Carolina and the Florida panhandle, sticking closer to the coast and in wet freshwater areas. Ironically, this tree’s populations are in decline due to fire suppression and is even rare in some areas of it’s traditional range. I am fascinated by this tree and would like to learn more about it. My friend Dave works for the Alligator River National Wildlife Refuge on the coast of North Carolina and monitors the populations of these trees (FYI, Red Wolves are also present there). Another kin is the aforementioned elegant Swamp/Bald Cypress that hugs wetter areas, Taxodium distichum. This is another beautiful and fascinating tree that used to grow in large ancient forests. Some of the oldest trees that still exist of this species can be found in eastern North Carolina swamps. For some reason tourists like to buy the cut off Cypress ‘knees’ that stick out of muck and water. The Eastern Red Cedars that grow on the coast look at bit different. I’ve seen them on Cape Hatteras intermingling with coastal Greenbriar (Smilax sp. ), Muscadine (Vitis rotundifolia), Live Oaks (Quercus virginiana) and more. These Eastern Red Cedars are different enough that they are given subspecies status Juniperus virginiana var. silicicola and often is called ‘Sand Cedar.’ They are beautiful and gnarled from wind and salt spray like what is familiar of Juniper growth habits in the southwest. In the southeast there’s also low growing and uncommon Juniperus communis var. depressa (Spira). Eastern Red Cedar berries are loved by birds, including Cedar Waxwings, American Robins, and European Starlings (Spira 241). This past weekend on a plant walk with Luke Learningdeer, a teacher of mine over the years- he told a story from a sit spot where he watched birds start at the top of a Eastern Red Cedar and work their way down eating every berry. When it got dark, they flew away, leaving all of the lower branches still full. They came back the next day to finish eating the rest. Generally Junipers are dioecious (separate male and female plants) but occasionally they veer from this binary (like everything in nature is actually non-binary). You’ll often see a field of trees with no berries, and sometimes filled with berries. This could be due to many factors, and the appetite of currently residing birds is just one of those variable. As you move west or north from the east coast of Turtle Island, the Juniperus species that you find change and morph. You’ll find Juniperus ashei, Juniperus monosperma (One Seed Juniper), Juniperus scopulorum (Rocky Mountain Juniper), different versions of Juniperus communis and Juniper utahensis, Juniperus californica, Juniper occidentalis (Western/Sierra Juniper) among others. Of course, they hybridize where overlapping like many plants with such variability do. My knowledge of these species varies, I am just getting to know some of them. The work to understand them, distinguish them from one another, see where they like to grow (high, or low, or with Piñons or not..) seems like a lifetime of work. Forgive me for the holes in this piece as I know someone who has spent more of their time in the Southwest or Canada would write this totally differently. Juniperus virginiana. South Hill, VA. October 2018. 5. Above is a video shot by Kym Slade of me chatting about Eastern Red Cedar / Juniperus virginiana on my parents’ farm in southern Virginia. It got cut off at the very end from a mishap with Kym’s phone. Enjoy the tidbit! 6. Juniperus communis is a species of Juniper found abundantly throughout the world, perhaps most so out of any woody shrub, and perhaps of any conifer (Enescu). It is found mostly in the north, but scattered into the southwest, Minnesota and ‘New England,’ and all across Europe, parts of the Middle East, the Himalayas and other parts of Asia, Russia and Japan. It’s use historically in medicine traditions follows this range, and curiously, many of these ways are similar, even to the use of Juniperus species on Turtle Island by it’s native inhabitants. As I mentioned earlier, Junipers have different leaf forms, some needled, some scaled. Usually younger plants have needled leaf forms, and as the plant gets older the leaves scale up (but not always). This species of Juniper tends to stay in needle form, growing in whorls of three. There is also a white band found on the top of each needle. Likely Juniperus communis at Windblown Cross Country Skiing when I worked there as the ski shop manager for several winters. Somehow my brain remembered I had this picture stored somewhere. 2011? New Hampshire. …In Britain there has been a substantial decline in both the distribution of juniper and the size of juniper colonies, particularly in England. Because of the wide geographic range of Juniperus communis, it is incredibly variable and has many subspecies, of which I won’t suss out here. It thrives in harsh environments and full sun. It is considered a pioneer species, like Juniperus virginiana, growing in places first before anything else is able to. This species of Juniper also hosts ‘rusts’ in Europe like Gymnosporangium clavariiforme. According to Conifers of California (Lanner), it even grows up at high elevations above 11,000 feet, alongside the ancient Bristlecone Pines. See our blog post on the Bristlecones, here. It does indeed grow in California too, but its range is not well known. On Wheeler Peak. Great Basin National Park. Nevada. 2016. This is the peak referred to in Conifers of California, where Common Juniper grows with Bristlecone Pines. Utah Juniper likely? In Utah there are several different species of Juniper that can grow together. I can’t always tell them apart. Taken in Canyonlands National Park near Moab, Utah. 7. Utah Juniper is usually found growing with Piñon Pine, especially the single-needled variety. My plant write up on Piñon can be found, here. It is most known for its importance in the Piñon Juniper woodland of the Great Basin Desert, but its range also extends into other deserts and ecologies to the north and south of the Great Basin. Like other Juniper species, it can thrive in harsh environments, and quite possibly prefers those habitats. Utah Juniper is different from other Junipers in a couple ways. It had larger 'berry-esque’ seed cones, and actually tends to be monecious (multiple sexes on one plant) rather than dioecious (different sexes on different plants) most of the time. Birds, jackrabbits, even coyotes and humans eat the ‘fruits.’ The wood, like other Juniper species has usually been used by humans where the plant grows- as carved items useful for everyday life or as fence posts resistant to rot. Like other Junipers, it dies in fire. Due to the Pine Bark Beetle (and other pests) killing millions of Pines of different species across the West, Juniper species are thriving in the wake of dead trees. The proliferation of this beetle is largely due to rising global temperatures, drought and shorter winters. This beetle is a native species. Here’s an article on the beetle, which I highly recommend reading up on and being aware of when engaging the Piñon Juniper woodlands of the west. Juniper Piñon woodland, New Mexico. 2015. Juniper Piñon woodland, Nevada. 2017. Piñon and Juniper in Utah, near Moab, Utah. 2017. 8. There’s a lot to say about Juniper as a food, medicine and tool, and I know I’ve explored the tendrils of this plant pretty deeply thus far. The significance of Juniper culturally and ecologically on a global scale cannot be ignored. Again, it is important to note the similarities in how it is used in different locations around the world. It’s use for fire, craft, food, medicine, protection, and cleansing no matter the species and location seems to be universal, even if the methods vary. Juniper is a powerful anti-fungal. The leaves, branches or berries as a wash can aid in the mending of foot fungus. Infused in vinegar, and used to clean a moldy house (a common problem in the Southeast in the summertime) it can kick back black mold that is harmful to human health. It is also used in making containers, ‘cedar’ chests. While ‘cedar’ chests are made of mostly Cypress family trees also known for being anti-fungal and rot resistant, these same chests made from Juniper species can also have this function. The subtle aroma can also keep bugs away. Juniper berries and twigs are diuretic. Juniper is also antibacterial, so it’s use for UTI’s is logical. It helps the body to push out bad bacteria while also killing back that bad bacteria. I’ve used the berries for that purpose— but I would suggest also pairing it with a powerful berberine-containing plant (Barberry, Oregon Grape before Goldenseal or Goldthread if possible) and an appropriate Heath family plant (Blueberry leaf, Manzanita leaf, Cranberry fruit, Uva-Ursi leaf) for further flushing. Tea is best as alcohol is irritating to the kidneys, bladder and urinary tract especially during an infection- but I have taken a mild tincture of the plant in hot tea made with the said plants and feel like double timing it was a powerful way to knock the UTI out. I would be careful with using Juniper berries once the infection has gone to the kidneys. Have antibiotics nearby and a doctor to consult as UTI’s are nothing to mess with. Juniper berries have been used for the treatment of diabetes, and there is a measurable action of the berries with insulin in the body, but this I don’t have experience with or know a lot about. I would stay away from Juniper berries and leaves internally during pregnancy, as multiple cultures view Juniper as an abortifacient. As I have mentioned in other plant profiles- the German Commission E was a paid for scientific research project done by the German government to investigate the medicinal qualities of popular folks herbal remedies in Europe. Most of the research ‘proved’ the common uses of the plant as true. Unfortunately, some of this research was done on animals. While a tea of the young twigs or berries is helpful for UTI’s and increased digestive function, Juniper can also be used in conjunction with other immune supporting plants for colds and stomach upsets. Cross-culturally, Juniper branches and berries have been used in times of sickness- as a wrap on the body, or as a strong tea. The berries are used as a food and spice for flavoring. I mention different ways this has been the case below in more detail. Juniper berry / Madrone berry strung fresh. 9. Juniper is perhaps first and foremost known for ‘protective’ abilities spiritually, energetically and physically. Whenever working with plants that offer ‘magic’ or protection in the human world, I sit back and think about all of the ways we interpret what magic is from a western perspective informed by the settler-colonialism narrative. I formerly studied Philosophy and Anthropology, and these questions were always on my mind: firstly- why is it that there are mostly white men studying mostly brown people? Other questions I had: Why was language of the ‘civilized’ vs. ‘uncivilized’ used when talking about ‘other’ cultures which were under study? Did these people actually give consent to being studied, observed and imposed upon by an outside white male looking to be the ‘discoverer’? Why do anthropologists hide in their writings the actual magic and ‘supernatural’ they really witnessed? Anthropology and perhaps even its branching out into Ethnobotany which is what I primarily work with in my writings— is inherently flawed as a ‘field of study’ because it is assumed that the lens from which to look at the human world in relationship to the natural world must be seen from a western scientific perspective. This assumes that all ‘magic’ must be explained away scientifically, or else one cannot be taken seriously aka. ‘the Carlos Castaneda effect.’ Anthropology was basically a field focused on ‘preserving’ ‘primitive’ cultures by observing them and making notes before the western world wiped them out, thereby museum-ifying real human beings and their way of life. Take a look at the sad and horrifying story of Ishi, for example. At the same time, magic is now ‘cool’ and the appropriation of symbols and rituals of magic from cultures that have been dominated over in settler-colonialism aka ‘western thought’ is rampant. This seems like an endless kind of watering down of whatever western thought sees as more authentic than itself. SO while magic isn’t taken seriously in the academic world- rain dances are just merely a ‘dance’ nothing more- magic is also bought and sold by the predominately white-skinned western world on a kind of surface level- more now that ever. And for a lot of money. The complexity of who owns what cultural symbols, traditions, clothing, and practices perhaps makes it a difficult conversation to have. I am always thinking too about how it isn’t necessarily my place or role to determine that for someone else- as a person of European descent. And, how also ‘holding in time like a noble savage time capsule’ the ‘idea’ of cultures without allowing them to change and morph and express whatever version of what they want into the world is also a form of settler-colonialism. It is even ridiculous that ‘triangulating’ cultural uses of plants that grow in different locations is even necessary to ‘prove’ the magical or even physical medicinal properties of those plants or group of plants. So, the point of all of this? To offer another seed to think about the importance of considering magic real, and to also be careful how we use this magic, and that we do not do harm to those who have not been able to practice it freely. 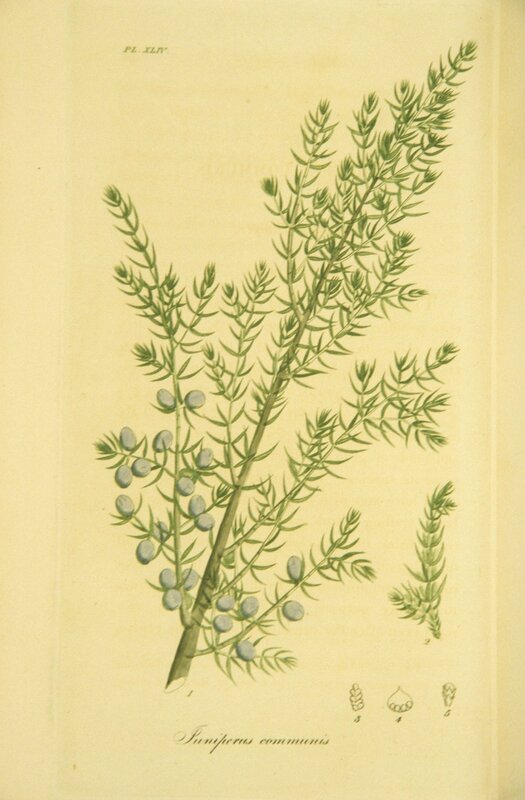 Juniper has been considered magical and protective via it’s smoke through burning the leaves and branches all over the world where it grows, including in Europe and northern Europe which has a complicated history onto itself of brutally erasing the magic of its own land-dwelling inhabitants. It has been made into incense for fumigating spaces to ‘cleanse’ them physically and energetically. Even the hanging of Juniper branches in spaces, above doors, on the walls, helps to protect the space from people or spirits with bad intentions. Juniper is a plant of boundaries, and there is no denying, even with all the ‘triangulating’ aside, that it simply works. 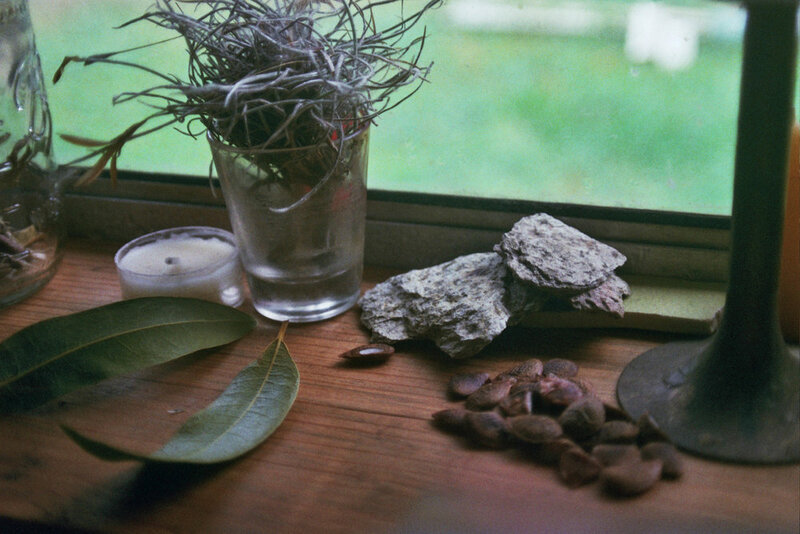 Try burning a sprig of Juniper and smelling it, or hitting the branch against your legs or feet- the practice of feeling into the experience of its ability to work with boundaries is the best way to know magic is real. 10. J. communius is the main species that grows in Europe and Scandinavia. It is used in cooking food, preserving and pickling vegetables. It’s method of use varies in Europe, and is often associated with sauerkraut as an added flavoring and preservative element. Sauerkraut is a ferment using cabbage, salt and spices — originally from China and originally using rice wine — and is more often associated with Germany and other parts of Europe. 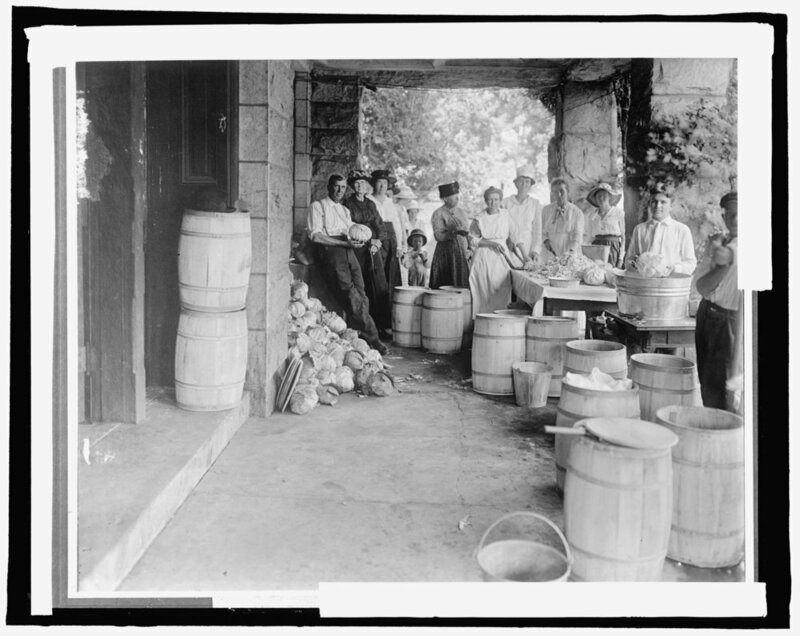 Making Sauerkraut, photo from the Library of Congress. a spirit that most folks recognize as a favorite ingredient in slightly bitter, sometimes citrusy mixed drinks. The word ‘Gin’ is derived from the word Juniper and it is the primary herbal ingredient. It is also required that anything labeled and sold as Gin currently must have a certain percentage of Juniper berries in it. Flavors vary according to location of the Juniper plant. Different soil and climate conditions can affect the flavoring of Juniper berries in Gin. 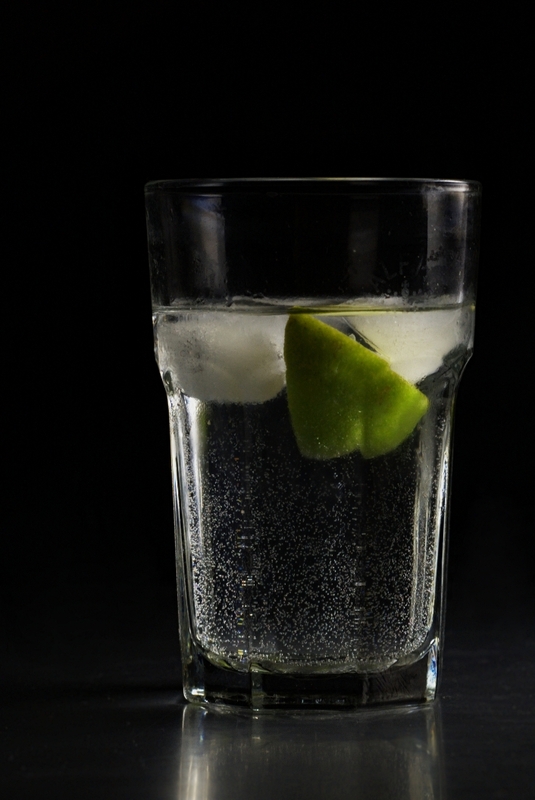 Gin and Tonic. credit cited at bottom. Juniper berries are primarily used dried as opposed to fresh in gin production, but their flavour and odour is at their strongest immediately after harvest and declines during the drying process and subsequent storage. Often it is distilled with the young branches as a strainer and the ‘berries’ lightly crushed as the main component. Traditionally J. communius was used, and is still used to make Gin in Europe. It seems like Juniper’s use in brewing is universal in Europe with the most concentrated popularity being in northern Europe, perhaps where it’s use in brewing originated. There’s a lot to say about how the use of plants like Juniper in things like alcohol spread from one location to another— and morph and shift according to environment and culture. Here’s an interesting article on the matter, here. Folks are currently branching out experimenting with using other species of Juniper in North America and beyond. It certainly makes sense to use the plant in the place where you are brewing if possible. Given the abundance of Juniper in the western U.S., it seems obvious to use a local variety. Talking to a friend who lives in New Mexico, she said that the local Gin distillery imports their berries from Europe though Juniper grows all around because they are afraid the local variety is poisonous. Each Juniper can impart different flavors, and some can be quite bitter. Gin is often used in bitters drinks: cocktails combining some amount of bitter herbs infused in sugar, honey, alcohol, glycerin, vinegar or some combination thereof and taken before or after a meal with added tonic water to increase the efficiency of digestion. These can be called Apéritif (before the meal) and Digestifs (after the meal). There are lots of things out there used as Apéritifs or Digestifs and that would be a whole other writeup! There are also other drinks made in different parts of Europe like ferments and soft drinks that contain Juniper. Savin and Genvrette are two examples. Juniper is used in the traditional sauna as well as in bathhouses alongside plants like Birch in the form of small brooms used to gently hit the body, creating heat and releasing oils from the plants. Put smashed Juniper berries in first, and then rest of ingredients. Stir. Du Song Zi - Traditional Chinese Medicine. 12. In TCM, Juniper is used similarly to what has been cited thus far: for increased digestive function and flushing the kidneys and liver. It is associated with the Spleen and Lungs, and if you’re familiar with TCM at all, this is different that our western anatomical understanding of Spleen and Lungs. It is also considered an energetically protective plant in this tradition. J. communis and other regional species are used. 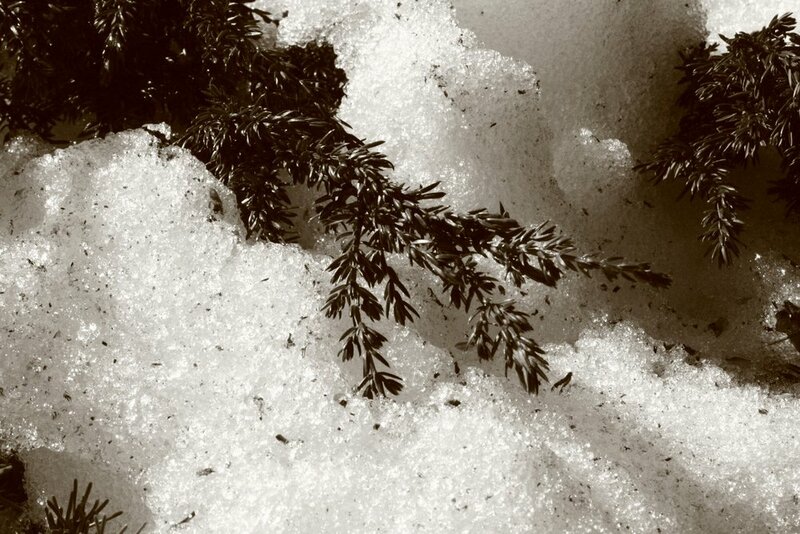 In Russia, Juniper is used in their sauna and baths similarly to how the Scandinavians use it. It is also a component in some vodkas and alcohol spirits. 13. I know there’s so much more to say about each regions’ use of Juniper. While I am no expert on the global historical use of this plant, I put it all here with the aim of bringing together the similarities and differences, and perhaps for my own ongoing understanding of how plants and their food and medicines for the human body as well as other animal bodies have nuance. The Greeks used Juniper berries as a food and spice, and I see the exact same information out there on the internet repeated over and over that it was used to increase ‘stamnia’ in the Olympic games and was used as a ‘black pepper’ substitute. It bores me to repeat this information without knowing more so that’s all I’m going to say about it until I see deeper. When I was 18, I went to Greece, and I noticed that much of the wind swept rocky terrain is dry and without dense nutritive soil- a perfect home for Juniper to thrive. I wouldn’t mind going back again with an eye for plants, when before I only peripherally noticed them. Juniper was brought to Egypt by the Greeks, and the seeds founds in burials and trash piles are indeed from Juniper species in Greece. 14. Several species of Juniper grow in the beautiful Boreal forests of Canada and the Northlands. There’s the low and shrubby Juniperus communis, which probably gets pretty covered by snow in the winter. Eastern Red Cedar, Rocky Mountain Juniper and a few others also grow in the region depending on the location. I also mentioned earlier that different Juniper species grow into the U.S. and southwest, including Utah Juniper, Eastern Red Cedar, Rocky Mountain Juniper, Sierra Juniper, California Juniper and more. Native American Ethnobotany cites dozens of tribes in the north and into the currently so-called United States and their uses of Juniper, here. The most common use medicinally is for cough, colds, stomach ailments but the list is very diverse. I can’t do justice to the nuance and appreciation each tribe has for this plant on an individual level but I want to adknowledge that it was and is extremely important to the native folks in North America where it grows. From a protective standpoint, Juniper, again is used by many different native tribes of Turtle Island to protect the home from bad spirits, chaotic weather, the danger of unpredictable wild animals, the people who just buried the freshly dead, and more. I don’t want to generalize here, and I realize the transmutation of this information in some kind of consolidated form through the lens of white western men who wrote it down from their perspective of what they ‘think’ native folks used it for can be problematic. This is the case for talking about a lot of folk knowledge of plants in turtle island. Handle this information with care. Juniper wood can be used for bow/hand drill or friction fire- the process of starting a fire without a lighter. The bark can be ruffled up and used to ignite a coal, too. “On the cliff at Hat Point, near Grand Portage Ojibwe reservation's harbor in northeastern Minnesota stands a 400-year-old sacred cedar tree -- Manido Giizhigance, Little Cedar Tree Spirit. The cold winds of her long life on the cliff-edge of Lake Superior have twisted and bent that tree, but she has bravely survived. She represents sacred powers. Her sculptured form is of great beauty and inspiration. It is very annoying to Indian people that this tree has been called "witch tree" by the state of Minnesota hustling tourists. Crowds of disrespectful tourists come out to the edge of the cliff to see it. The tree has been vandalized and its existence is threatened by the hordes. If you have ever tried to pray, quietly or perhaps with singing, alone or in a group of Indian people, all at some natural sacred place for that sacred purpose, you know the importance of quiet and openness to what is there. Of general respect by everyone in the group. The only time I went there, with a family from Nett Lake to pray for their brother, we were actually photographed and pointed at by repulsive, noisy tourists. I never went back, it was somehow spoiled for me. When I think of that tree, I can't help but feel it is spiritually dead, because for us it was killed spiritually by those tourists, their silly babble, their cameras. 15. For our October land capsule mail packages, we are sending out 1 oz Piñon Juniper Bitters made from Piñon Pine (Pinus monophylla) cone pitch and needles infused in vodka and sugar + Juniper berries (Juniperus utahensis) infused in vodka and honey for a simple pairing that matches the the two plants’ preferred ecological placement. This will be sent with other goodies in mid-November. These are art + plant themed packages sent to subscribers of the Ground Shots project at $30/up. To support the project and receive mail from us, click here. We could not do this work without patreon subscribers. 16. We spend tons of time putting each of these profiles together, which we usually release to patrons first and then free to the public. They are an ongoing documentation of personal research into plants without any kind of academic sponsorship or grant funded backing. I have self-funded and traveled to meet plants first hand, aim to listen to folks in specific place, and aim to focus on the nuances of the intersection of peoples and place when talking about plants. The idea of these plant profiles in the context of The Ground Shots Project is to connect ecological webs to further support the understanding of our inherent interconnectedness with one another and the land. Your support helps us to continue to do this work and share it with you freely. Web. On Wikipedia- Juniperus virginiana, Atlantic White Cedar, Arizona Cypress. Accessed October 2018. Weir, John R. and Scasta, Derek J. “Ignition and fire behaviour of Juniperus virginiana in response to live fuel moisture and fire temperature in the southern Great Plains.” International Journal of Wildland Fire. CSIRO PUBLISHING. Oklahoma State University. Stillwater, OK: 2014. Spira, Timothy. Wildflowers and Plant Communities of the Southern Appalachian Mountains and Piedmont. Pollan, Michael. ‘The Botany of Desire.’ Random House. New York: 2002. Elpel, Thomas J. Botany in a Day : The Patterns Method of Plant Identification. 6th edition. Hops Press. Pony, MT: 2013. Teaching with, impressions from, shares with, and acknowledgement of folks who have stuck in my mind over the years of sharing ideas about Juniper and related plants: Luke Learningdeer, my dad Andy Moody and Juliet Blankespoor on Eastern Red Cedar, Peri Lee and Erin Fahey on Cypress/Junipers of the Southwest, Aganaq Kostenborder and Ted Packard on Western Red Cedar, Dave ? and Andy Jenks on Atlantic White Cedar. Lanner, Ronald. Conifers of California. 3rd edition. Cachuma Press. Los Olivos, CA: 1997. Rhode, David. Native Plants of Southern Nevada: An Ethnobotany. The University of Utah Press. Salt Lake City, Utah: 2002. Parveen Kumar Sharma and Brij Lal. Ethnobotanical notes on some medicinal and aromatic plants of Himachal Pradesh. Indian Journal of Traditional Knowledge Vol. 4(4), October 2005, pp. 424-428. Web. Accessed Oct 2018. Herbal Medicine: Expanded Commission E, Juniper berry. American Botanical Council. Integrative MedicineCommunications.http://cms.herbalgram.org/expandedE/Juniperberry.htmlts=1540997832&signature=65110ab36f194e8344f999205c28e846 Web. Accessed Oct 2018.